Located all around Capeview Apartments and Kings Beach is a multitude of attractions and venues to fill your days. That is if you decide the beautiful beaches and local cafes and restaurants located outside our doors aren’t enough. 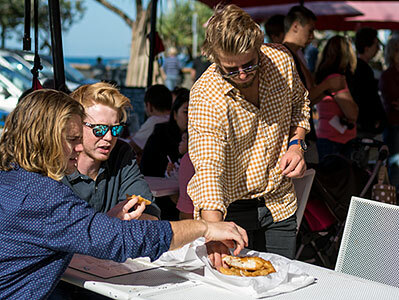 While staying at Capeview Apartments grab the opportunity to check out the locally renowned Caloundra RSL with its many restaurants and cafes. Take the children and let them experience the “kids club”. Caloundra RSL, as well as many other licenced venues in and around Caloundra, even offer a courtesy bus service to collect you and return you to your apartment. Sometimes holidays are about more than just eating and swimming. There are events and attractions located within a short distance from Capeview Apartments. Open almost every day all year around. From Markets to theme parks, museums to zoos. 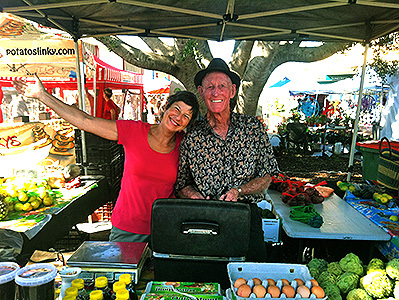 The Sunshine Coast has them all and lots more to see and do. Capeview Apartments in Kings Beach is a terrific base for enjoying your Sunshine Coast holiday. With so much to see and do you’ll be spoilt for choice. Bulcock Street Caloundra transforms into “Caloundra Street Fair” every Sunday morning 52 weeks a year. 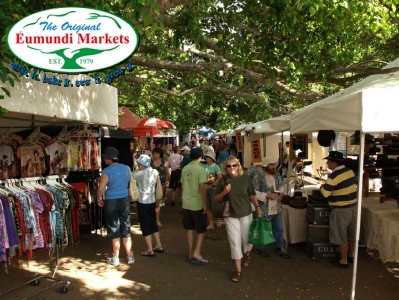 With more than 200 unique Stalls there is something for everyone from the very young, to, well, the not so young. With gifts, food, plants, clothing and the unusual, all on display. This vibrant, bright event is a definite not to miss during your stay at Capeview and is only a stroll from your holiday apartment. After an affordable meal and an ice cold beer? Then the Caloundra RSL is the place for you. Five dining options, four bars and The Cosmic Cave Kids Club means families young and old will enjoy their visit. Courtesy bus service, bottle shop, TAB and 280 of the latest gaming machines are all included. For more information click here. The Caloundra Coast Walk is a coastal-hugging walking path from Golden Beach, passing through Pumicestone Passage, Bulcock Beach, Kings Beach and north up into the Caloundra Headlands. From Capeview Apartments, head south with your fishing rod as the Pumicestone Passage section of the walk provides great fishing from the boardwalk straight into passage. From Happy Valley back to Kings Beach the timber boardwalk follows the coastal dunes and sandy shores – adults and kids alike love detouring down to the rock pools. Then through Kings Beach, taking in the heritage-listed Kings Beach Bathing Pavilion constructed in 1937 and north to the Caloundra Headland with its monuments and memorials and of course, those amazing views of the shipping channel. 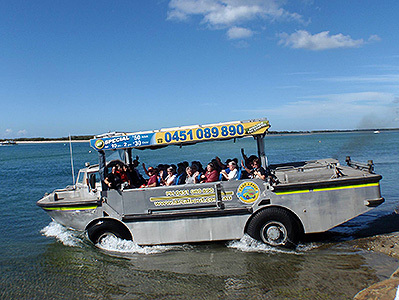 This one is definitely for the photo album – experience Caloundra’s only Amphibious Environmental Tour on, you guessed it, a Lighter, Amphibious Resupply, Cargo, 5 ton (or LARC) – an aluminium-hulled amphibious cargo vehicle. Your LARC will take you on a tour of the Pumicestone Passage on the north-western side of Bribie Island, taking in migratory and regional birds and marine life including dugong, dolphin and turtles. To book or find out more information click here. Enjoy the beauty of Pumicestone Passage, this time, on a guided kayak tour with Blue Water Kayaks. The half day tours cost $90 pp, which includes morning tea. Twilight tours cost $55 pp. Family and group discounts are available so please enquire. Full day tours can be arranged for groups of 4 or more at $150 per person. To book or find out more information click here. Open every day (except Christmas Day) from 10 am to 4 pm. 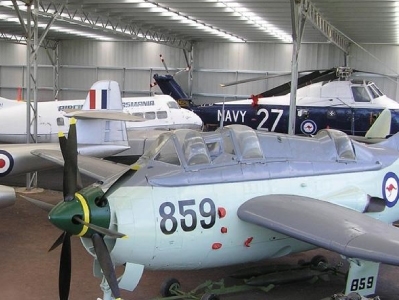 See the largest collection of Australia’s past flying history with planes and other flying machines all in the one location. Beautifully restored examples of our past. Spend some time wandering around the Queensland Air Museum with examples of Bombers, Fighters, Transporters and Fright planes for all to see. From F111’s to Spitfires. Helicopters and seaplanes, from the expected to the unusual. Definitely worth a visit and only a short drive from Capeview Apartments. Visit the Irwin’s and all their animal friends at this world renowned Zoo. 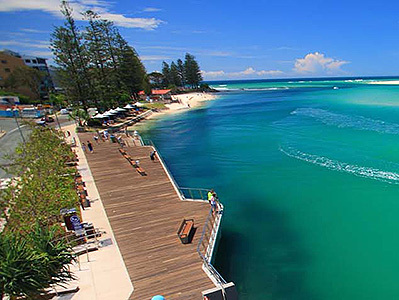 The popularity of this place spreads throughout the world but many do not realise, when visiting the Sunshine Coast, just how close they are to the awesome attraction. 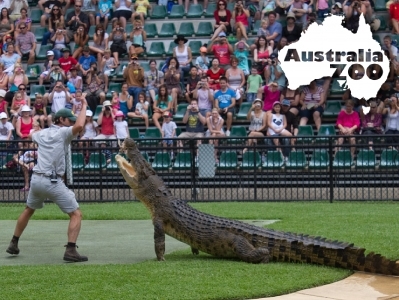 Located at Beerwah, out on Steve Irwin way, Australia Zoo is less than a half an hour drive from Capeview Apartments. Open every day (except Christmas Day) from 9 am. With regular shows and tours or just do your own thing and wonder around this huge complex. With food and refreshments available, why not make a day of it? Aussie World Fun's their Thing! Visit Aussie World for a great value fun day out. 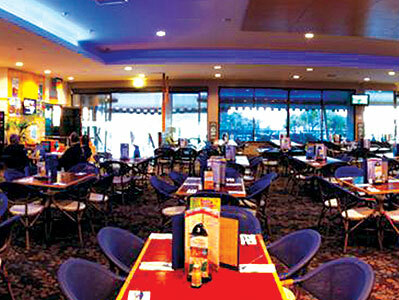 Located just a short drive from Capeview Apartments, Aussie World is located on the Bruce Hwy. They open their gates every morning (except Chrismas Dany and ANZAC Day) from 10 am. 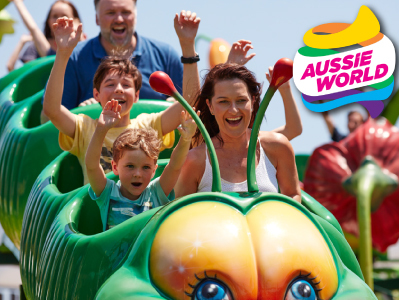 With over 30 rides and attractions, all included in the entry ticket, allow yourself plenty of time to make the most out of your day at Aussie World. The Pub at Aussie World is a great place for lunch and a cold drink. 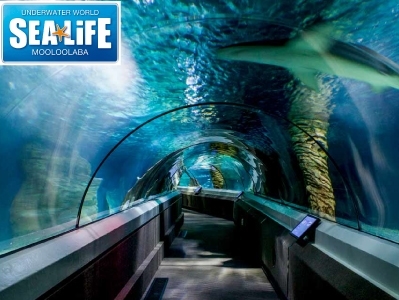 Sea Life Sunshine Coast Aquarium (formally known as Underwater World) is located in Parkyn Parade, Mooloolaba and is an exciting place to see everything marine. With a large range of living sea creatures coupled with the ability to get “close up” ensures a viewing pleasure rare to find. Recently completed renovations and redevelopment of this attraction will guarantee an experience worth your effort. Sea Life Sunshine Coast is open daily from 9 am to 5 pm. Find out more…. 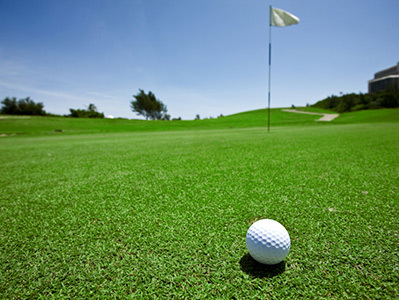 The Greg-Norman designed Pelican Waters golf course is a 10 minute drive from Capeview Apartments, so don’t forget to bring your clubs. 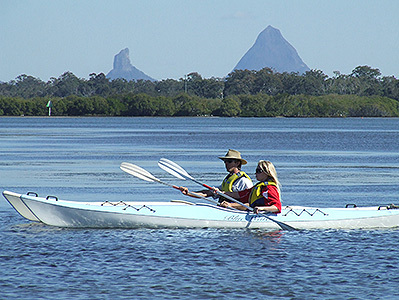 The 6,289-metre championship course has challenging terrain and the scenic backdrop of the Glasshouse Mountains. From mid-June until early November the ‘whale-way” is at capacity as these beautiful creatures migrate from their winter homes in the Antartic Regions to the tropical playgrounds in and around the Great Barrier Reef. 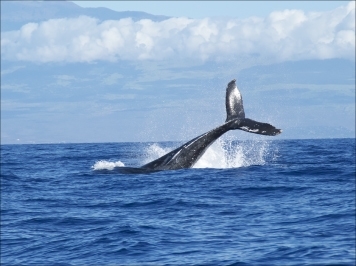 From the balconies, at Capeview Apartments the tail slapping antics of these majestic whales can often be seen. Organised whale watching is an annual event here on the Sunshine Coast and you can grab tickets for one of these tours and enjoy everything that is beautiful off the coast. 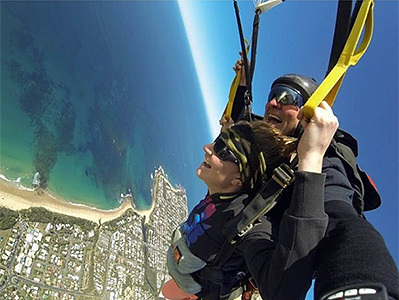 If a soft and sandy beach landing following your tandem sky dive is just want you’re after, then Sunshine Coast Skydivers are the dare-devils for you. And, you’ll land right on the beach at Kings Beach, a stone’s throw from Capeview Apartments! If you’re not brave enough to jump, you can watch all of the sky diving action and the exciting beach landings from your unit balcony, but if you’re ready to take the plunge, click here for more information. Kings Beach offers a terrific variety of eating places, many of which take advantage of their brilliant location by offering al fresco dining with views to die for. And the best part is, everything is within walking distance of Capeview, including the local bottle shop! So whether it’s an early morning short black on the beach, scrumptious fish and chips for lunch or a counter meal or Italian for dinner, your best beachfront holiday starts right here. A café located right on the beach? You bet – the Coffee Cat on Kings Beach has arguably one of the best latte locations on the planet! 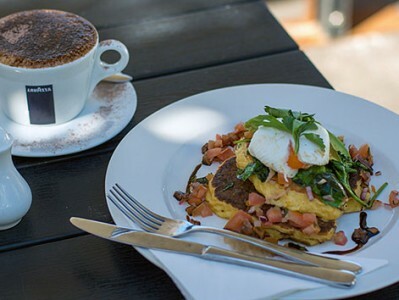 Located right on the beach right across the road from Capeview Apartments, the Coffee Cat is the perfect spot for breakfast or lunch, and serving one of the best coffees in the world – Lavazza Top Class. Rob and his team at De Lish Fish serve some of the best seafood on the Sunshine Coast. Consistent, with a dedication to quality, fresh, local seafood, De Lish Fish is open for lunch and dinner and is located right within view of Capeview Apartments. The menu is extensive too – fish and chips, burgers, seafood platters, salads and a genuine desire to serve top quality chips, there is something for everyone! And Rob’s Gelato has been winning prizes at the Brisbane Ekka too – he has been mentored by a Gelato Master – and the results are simply sensational. Great staff, great service, great food, great location – what more can we say? Domenico’s on Kings prides itself on providing a great family atmosphere, terrific service, amazing location and of course, gorgeous traditional Italian food. Domenico’s has won the Best Italian Restaurant award for the Sunshine Coast in 2011, 2012, & 2013 (2014 voting open now!) and is open for breakfast, lunch and dinner. 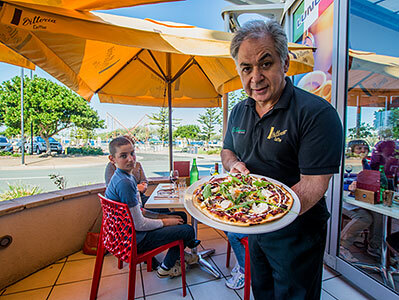 Located walking distance from Capeview at 79 Edmund Street, Kings Beach, Domenico’s is one of our favourite local spots. Kings Beach Tavern has been part of Caloundra since 1899, and just as the original Kings Grand Central Boarding House was part of the old Caloundra, the Kings Beach Tavern today is very much a landmark of the new face of Caloundra. 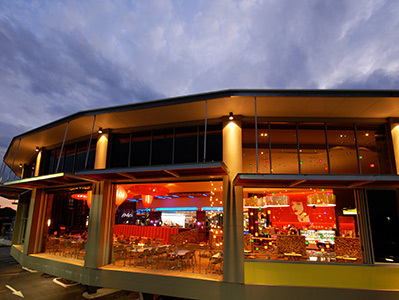 The Kings Beach Tavern was designed to appeal to Caloundra families and holiday makers, with a fantastic bistro, bar and gaming room, a great kids playground and bottle shop, all overlooking Kings Beach. Kings Beach (and indeed Capeview Apartments) provides the most amazing views of the busy Brisbane shipping channel. 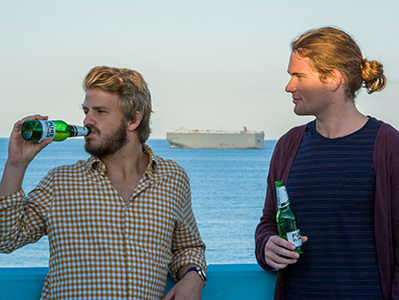 Watch container ships and luxury passenger liners alike sail by in close proximity – the views are even more magical at night, from the balcony of your apartment!